This is the home blessing ceremony based on the Roman Ritual that our family uses each year. Have on hand: Holy water Chalk (we used colored chalk because our lintels are white) Optional: We often light candles and have burn frankincense and myrrh during the blessing. We write on lintel above our front door on the inside. Make sure you clean the door frame before the ceremony. Only a priest can impart the priestly blessing on holy water, chalk or the home, but the head of the household with his baptismal graces can bless the family and home in a special way, using the sacramentals of holy water and blessed chalk. There is also a PDF form of this program. P: The star burned like a flame, pointing the way to God, the King of kings; the wise men saw the sign and brought their gifts in homage to their great King. All: My soul proclaims the greatness of the Lord, my spirit rejoices in God my Savior; for He has looked with favor on his lowly servant. From this day all generations shall call me blessed: the Almighty has done great things for me, and holy is His Name. He has mercy on those who fear Him in every generation. He has shown the strength of His arm, He has scattered the proud in their conceit. He has cast down the mighty from their thrones and has lifted up the lowly. He has filled the hungry with good things and the rich he has sent away empty. 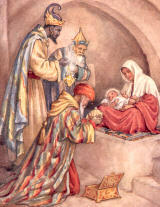 All:	The star burned like a flame, pointing the way to God, the King of kings; the wise men saw the sign and brought their gifts in homage to their great King. P: Many shall come from Sheba. P: O Lord, hear my prayer. O God, who by the guidance of a star did this day reveal your Only Begotten Son to the Gentiles, grant that we who know You by faith may be brought to the contemplation of the heavenly majesty, through the same Christ, Our Lord. All: Be enlightened and shine forth, O Jerusalem, for thy light is come, and upon thee is risen the glory of the Lord, Jesus Christ, born of the Virgin Mary. P: Nations shall walk in your light, and kings in the brilliance of your rising. P: Bless, + O Lord God, this creature, chalk, and let it be a help to mankind. Grant that those who will use it with faith in your most holy name, and with it inscribe on the doors of their homes the names of your saints, Caspar, Melchior, and Balthasar, may through their merits and intercession enjoy health in body and protection of soul; through Christ our Lord. P: Let us pray. O Lord, Almighty God, bless this house + that it may become a shelter of health, chastity, self-conquest, humility, goodness, mildness, obedience to the commandments, and thanksgiving to God, Father, Son and Holy Spirit. Upon this house and those who dwell herein may Your blessing remain forever, through Christ our Lord. Priest/Father: Almighty God, incline your ear. May you bless us and all who are gathered here. Send your holy angel who will defend us and fill with grace all who live here. Over us all to reign. Refrain. Worship him God most high. Refrain. Sealed in the stone-cold tomb. Refrain. Earth to Heav’n replies. Refrain.